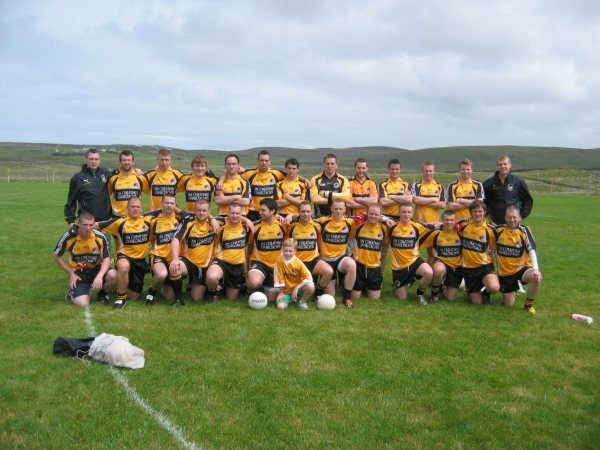 Tá Glór na Móna thar bheith sásta cur in iúll daoibh go bhfuil téarma úr d’ranganna Gaeilge le tosú arís. Beidh ranganna Gaeilge againn i nGaelscoil na Móna (1 Nasc na Móna) gach oíche Mháirt 19:00-20:30 agus beidh tús curtha leis an téarma úr ar an 8ú Meán Fómhair. Tá réimse ranganna ar an oíche Mháirt ó rang d’ghlantosaitheoirí go hardrang. Eascaíonn na ranganna Gaeilge foghlaim agus forbairt scileanna teanga agus cumasú sa Ghaeilge i dtreo líofacht. Cosnaíonn na ranganna ar fad £25 ar feadh téarma ó Mheán Fómhair go Nollaig. Is fir íocaíocht a dhíol ar bhonn tráthchoda. Beidh ranganna i mBunscoil an tSléibhe Dhuibh chomh maith (Bóthar Bhaile Uí Mhurchú), bunrang leibhéal 2 ag 9:30rn gach maidin Chéadaoin ag tosú Céadaoin 16ú de mhí Meán Fómhair. Beidh meánrang leibhéal 1 ag titim amach ag 18:00 ar oícheanta Chéadaoin chomh maith. Cosnaíonn na ranganna ar fad £25 ar feadh téarma óMheán Fómhair go Nollaig. Eagrófar imeachtaí eile i rith na bliana chun tacú le fhorbairt teanga ár bhfoghlaimeoirí chomh maith idir turais Gaeltachta agus dianchúrsaí, deán cinnte go nglacann tú an chéad chéim i dtreo líofachta. Le haghaidh tuilleadh eolais ar na ranganna, deán teagmháil linn ar 90 234442 nó oifig@glornamona.com. 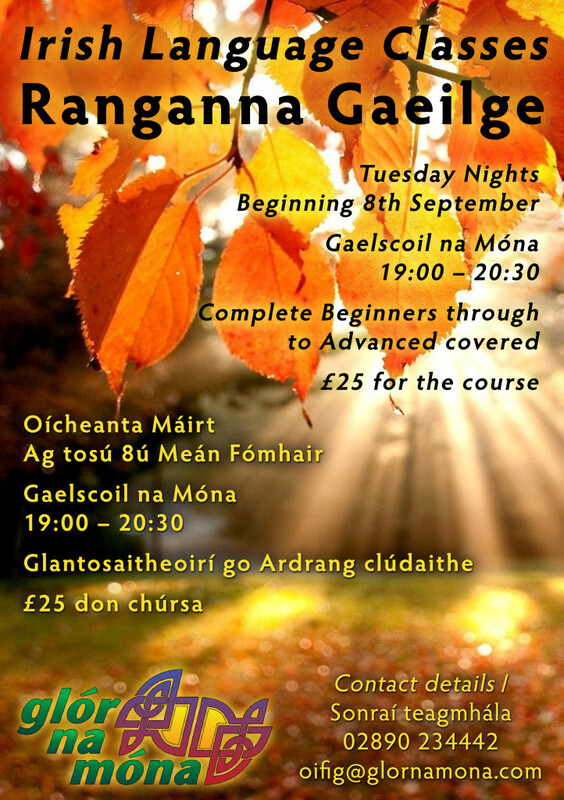 Glór na Móna are pleased to announce that new term of Irish language classes will begin at the beginning of September. We’ll run Irish classes in Gaelscoil na Móna (1 Monagh Link) every Tuesday 19:00-20:30, beginning 8th September. We offer a range of levels in Gaelscoil na Móna on a Tuesday evening, which range from complete beginner to advanced. Our Irish language classes facilitate the learning and development of language skills as well as supporting our learners in their journey to fluency. Classes cost £25 for the September to December term. Payments can be made via instalments. 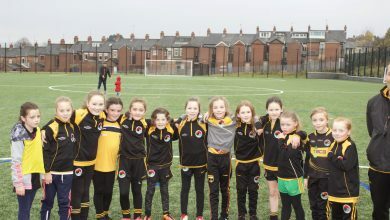 We will also have classes in Bunscoil an tSléibhe Dhuibh (Ballymurphy Road), there will be a beginner level two every Wednesday morning at 9:30 am, beginning Wednesday the 16th September. We will also run an Intermediate level 2 class each Wednesday evening at 18:00, this class will also commence on Wednesday the 16th September. Classes cost £25 for the September to December term. 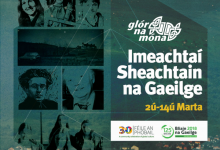 Glór na Móna organise additional events throughout the year which include Gaeltacht trips and Intensive courses in order to provide additional support to learners. Be sure to take the first step towards fluency! For further information on all Glór na Móna classes and activities, please contact us on 02890 234442 or oifig@glornamona.com . Hi just checking if classes have started back in Gaelscoil na mona and if I can join on 22nd sept?